American soldiers of the 99th Infantry Division are accompanied to the rear by paratroopers of 3rd Fallschirmjager Division. While this column was marched into captivity, they could see and hear the battle between German and American artillery not far away. The 99th Division had just begun combat operations on the Roer River on December 13, 1944 when three days later the Ardennes Offensive broke with a heavy concentration of artillery fire. Despite being an inexperienced unit and their lines pierced by many German armored columns, the small unit actions fought by the 99th would prevent the timely completion of the German timetable. At Lanzerath, a German speaking municipality in Belgium, The Intelligence and Reconnaissance Platoon of the 384th Infantry Regiment, 99th Infantry Division, under the command of First Lieutenant Lyle J. Bouck, Jr., comprised eighteen men but inflicted 400-500 casualties on the 9th Fallschirmjager Regiment, which failed to continue the assault. Bouck and his men were captured, but only one American was killed. This column of prisoners are lucky to have kept their winter coats and boots; some Americans were stripped of clothing. Many lost watches and jewelry when they were taken. 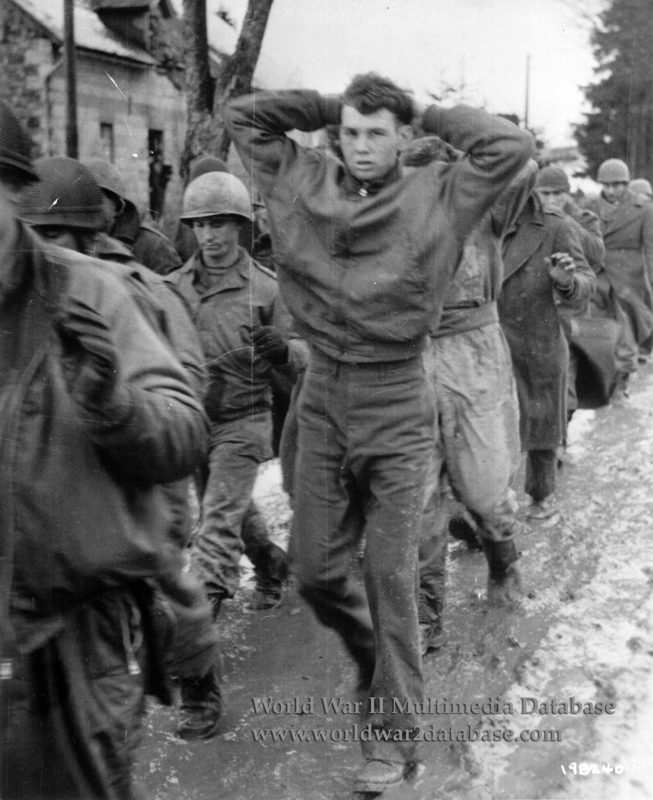 The thousands of American prisoners from the 106th, 4th, 28th and 99th Divisions were marched through Northern Germany, where food and survival were constant concerns. Most men lost an average of fifty pounds during their five month captivity. Some men, like author Kurt Vonnegut of the 106th, were caught up in the firebombing of Dresden in February 1945.